The quitter. The narcissist. The clone. The smartphone addict, eyes fixed on the tiny screen, doing…what? There’s a strange new creature living under your roof. Your job now is to figure out what makes teenagers tick, and to steer them to productive paths—away from the lures and dangers of drinking, drugging, sexting, bullying, and other bad decisions. 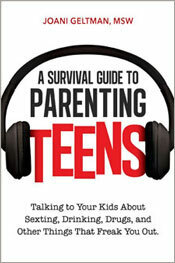 A Survival Guide to Parenting Teens makes it easier than ever before. Cutting through the teen drama and parental confusion, the book delivers fast answers and targeted solutions to 80 behaviors that drive parents nuts. Just locate the annoying or alarming problem you’re dealing with, and you’ll find a brief but insightful analysis of what your teen is really thinking and feeling, along with smart, effective advice on what exactly you should say and do. By acting quickly, calmly, and knowledgeably, you can halt your teen’s spiral, open up the lines of communication, and get them back into a positive, responsible, and respectful place. can bring to your school, business or community group. Snapchat photo leak: Should parents be worried? Wellesley Parents: Have Teens? Help is on the Way. Learn how the brain affects your teen’s behavior. It’s the battle of the thinking brain VS the feeling brain. Learn Effective strategies for arguing-The Four Ways Of Fighting. Develop effective strategies for keeping your teen safe as they explore the new world of teen life. Sexting. Texting and Social Networking: What’s A Parent To Do? Understand how the “emotional brain” of a teen gets “turned on” by social networking. Understand how the “Imaginary Audience” influences your teen’s performing on social media. Learn how your own behavior with phones and computers can positively and negatively influence your teen. Drugs and Alcohol: How Does Your Teen’s Personality Style, and Your Parenting Style impact their experimentation with drugs and alcohol? Copyright 2015. All rights reserved. Website Development by Susan Nigrosh.